On 05/22/2016 the Richland County Sheriff’s Department received a call of an intoxicated male party in the Richland Hospital parking lot leaving in a blue car. Deputies were able to locate suspect vehicle traveling north bound on Church St in Richland Center and did observe erratic driving while following the vehicle. Suspect vehicle was stopped at the intersection of 4th/Church St in Richland Center. When the deputy made contact with operator (Joshua Perkie) he noticed a strong odor of intoxicants coming from the operator of the vehicle and observed open intoxicants in the vehicle. When a check was done on Perkie’s drivers status it showed that Perkie was revoked due to an OWI related offense. Perkie was asked to perform standardized field sobriety test by deputy and showed signs of impairment. Perkie was arrested for OWI 7th offense, which is a felony in the state of Wisconsin. 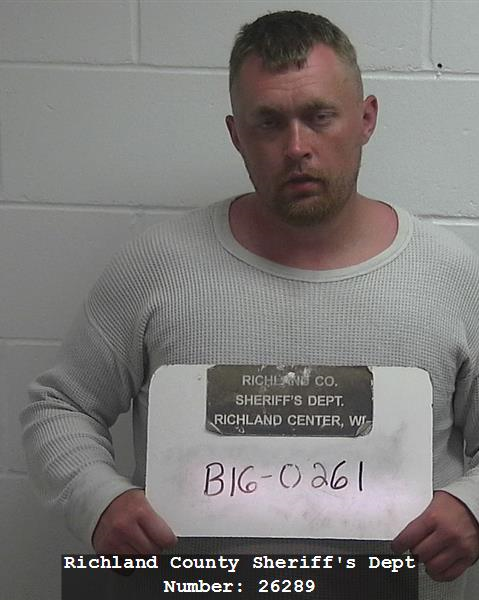 Agencies Involved: Richland County Sheriff’s Department and Richland Center Police Dept. ARREST or CHARGES: Joshua J Perkie: Operating while under the influence 7th Offense (Felony), Operating while revoked 2nd Offense and Failure to install Ignition Interlock Device.